Earlier on the Group’s website there were several articles about the Dutch American mining magnate from the Philippines – J.H. Marsman and his firm Marsman HK China Ltd (馬士文公司) which operated the Needle Hill mine between 1936 and 1951, the Castle Peak mine from 1936 to 1958 and the Morrison Hill quarry (except during the Japanese occupation from 1941-45). York also included this photo of Morrison Hill Quarry, the only image I have seen of the quarry itself. 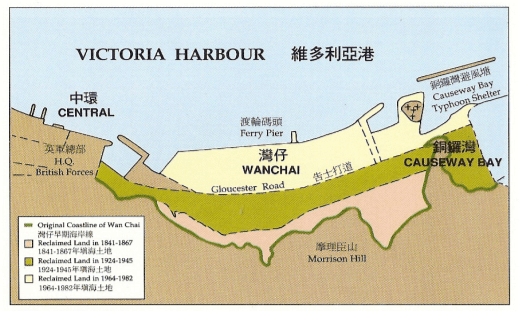 Morrison Hill (摩理臣山 or 摩利臣山) is an area and was a hill in Wan Chai near Happy Valley, on Hong Kong Island. 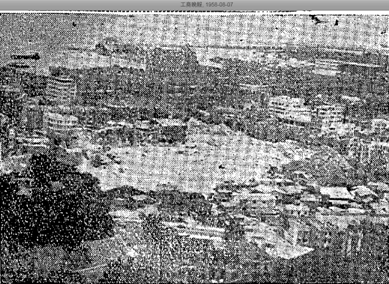 The hill was at the seashore until the Praya East Reclamation Scheme in the 1920s, which used its constituent rock/earth to reclaim land from the harbour, extending the shoreline away from the area. This major operation took most of the decade and to carry away the rock and soil, temporary railway tracks were laid, running along Bowrington Canal (present day Canal Road), which was covered over for the purpose. This article was first posted on 8th August 2018.